And it’s a winner…Spicy Pumpkin Carrot Muffins! Look, my photo is #4 on the top row! If you happened to be reading Fancy Pants Foodie about a year ago, you may have seen (or even tasted) my inventioneered fall recipe, Spicy Pumpkin Carrot Muffins. It was an experiment gone, well, right. Apparently, the folks at Foodista.com agree. The recipe was among 100 winners of their Best of Food Blogs Cookbook contest and will be published in a cookbook on October 19. Foodista and Andrews McMeel Publishing are thrilled to announce the winners of The Foodista Best of Food Blogs Cookbook contest! 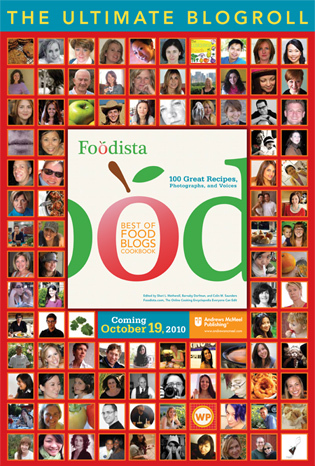 From December 1, 2009 through February 28, 2010, Food bloggers worldwide were invited to submit their favorite blog posts, recipes, and photos to compete for a spot in a published cookbook. After receiving over 1,500 submissions, which were then voted on by the Foodista community, the selection process shifted into a more traditional editorial effort (informed by community votes), to choose and edit the final 100 entries. Andrews McMeel will publish the winning blog posts and recipes in a beautiful, full-color, internationally distributed cookbook, set for release on October 19, 2010. Born out of the “Blog to Book” panel at the first International Food Blogger Conference (IFBC) in 2009, the cookbook celebrates the best food bloggers worldwide. I am SO excited!!! I know there are a lot of awesome, experienced food bloggers out there, with recipes better than mine…so I’m very blessed to have a recipe chosen for this book. Hope you’ll pick one up so we can do a silly happy dance together. Or at least cook some cool stuff. woooohooo- I am so happy for you and proud of you. You rock girl!! !